Update as of 4 May A.D. 2016: Over the past few years, I have been receiving an inordinate, and often inconsiderately expectant, amount of requests for valuations from people who have a bottle of whisky in their possession that they believe is of value. Please, feel free to use the information I have here as you need it, but do not request a valuation and expect a speedy response. I’m a really busy guy, and as much as I love investigating this stuff (and maintaining a certain level of expertise), I just don’t have the time to tend immediately to every request. I’ll help if I can, but only when I can get around to it. By the way, please contact me through the “Contact” page and not by leaving a comment here. If you are reading this little parenthetical note, then I still have this whisky and I welcome discussion regarding giving it a new home. The same goes for the 1930 Ballantine’s Scotch Pure Liqueur Whisky pictured in this investigation. I discovered this bottle in an online auction. It was advertised as having been bottled in the 1980s. One look and I knew the valuation date was incorrect. I bought it right away. 1. To begin, although Ballantine’s touts its beginnings as that of 1827, technically it began as a grocer. The company did not venture into scotch whisky production or sale until 1865 when George Ballantine’s eldest son, Archibald, decided to open a larger grocer in Glasgow. It was there that the Ballantine’s whisky endeavors began. Its reputation as a higher class, blended whisky earned it a favorable reputation and caught the attention of the corporate distillers. 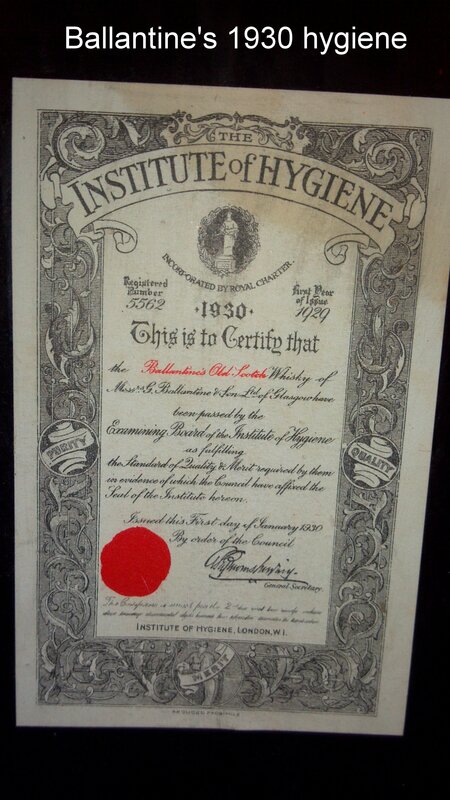 It was a wholly owned family business until 1919 when the company was sold to Barclay and McKinlay. Barclay and McKinlay focused heavily on the emerging Scotch whisky market and furthered the brand’s reputation, eventually selling it in 1935 to Hiram Walker, a Canadian distilling company with much more international sales and marketing muscle. It was Hirm Walker that truly established the brand internationally and secured it for the future success it now enjoys. Hiram Walker did eventually sell Ballantine’s to Pernod Ricard in 2005. 2. Ballantine’s is a blended scotch, which means it is made from a variety of single malts. According to Ballantine’s, each blend is comprised of no less than a precise combination of 50 editions. In 1936, the year after Hiram Walker acquired Ballantine’s, the Speyside distilleries of Miltonduff (established in 1824) and Glenburgie (established in 1810) were purchased to meet the ever-increasing demand for Ballantine’s whiskies and to supply the distinct malts used to create the blends. Miltonduff and Glenburgie were supplied by company owned grain distilleries in Dumbarton and Elgin. Many if not most single malt scotches are named for the distilleries from which they are produced, however, in the case of blends, a brand name is most often given. In the case of Ballantine’s, it is the name of the founder; however, the granaries rather than the single malt distilleries are mentioned on the label. 3. This particular edition is a Ballantine’s 30 Year Old blended scotch whisky. The first edition of the 30 Year Old was not bottled for sale until 1930. 4. Even though it began as a grocer in 1827, Ballantine’s holds to that same date with regard to the beginning of its whisky. Much can be deduced from this. As seen in the photo “Ballantine’s 1930” of a bottle of Ballantine’s Finest from 1930 (which I currently own), the label includes the subtitle “IN USE FOR OVER 100 YEARS—ESTABLISHED 1827”. This particular subtitle is a helpful clue provided by Ballantine’s toward providing accurate dating for later editions. For example, beginning in 1952, it should be noted that this subtitle was changed to “IN USE FOR OVER 125 YEARS” and then again in 1962 it was changed to read “IN USE FOR OVER 135 YEARS”, all of these keeping with the 1827 inception date. (See also photo “17 and 30 – 1963”.) Because this particular edition is marked with the subtitle “IN USE FOR OVER 125 YEARS”, it must be concluded that this particular edition was bottled sometime between 1952 and 1961, making its distillation date sometime between 1922 and 1931. 5. 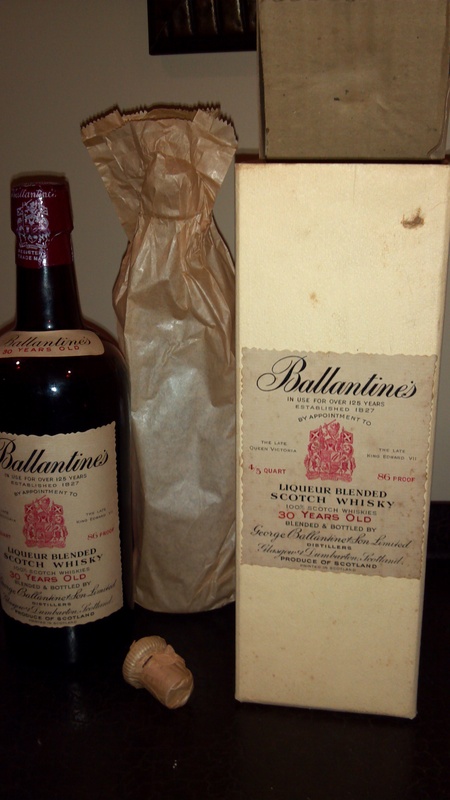 Ballantine’s began wrapping all of their editions in tissue paper sacks. The 1930s “Ballantine’s Finest” shown above is packaged in a tissue paper sack. Although I have inquired of Ballantine’s as to how long the company did this, no one seems to know. I did receive an extremely helpful word from a fellow collector who contacted me through my blog to notify me that he retains an unopened edition of the 30-year from 1955 and an unopened edition of the 21-year from 1957, both purchased in New York City and imported by “21 Brands, Inc.” (New York, NY). The 30-year was packaged in a tissue paper bag with a tie string while the 21-year is packaged in a similar box and yet is packaged without the bag. Now bear in mind that the tissue paper bags were used for all of the Ballantine’s editions. This leaves the impression that there would be no variations in the editions being bagged, and therefore, the absence of the bag for the 21-year edition from 1957 suggests a high probability that the tissue paper bag disappeared from Ballantine’s packaging process in or around 1956. 8. This bottle of whisky would appear at first to have been purchased in the United Kingdom since it does not have a label indicating the U.S. import company “21 Brands, Inc.” which was contracted by Hiram Walker in 1935 to be the sole importer and distributor for the brand. However, this bottle does have the Federal mark embossed into the glass which states “Federal Law Forbids Sale or Reuse of this Bottle.” It is important to note that following the repeal of the 18th Amendment (Prohibition) in 1933, particular regulations were put into place. The Federal mark was required for every bottle produced and/or imported for sale in the United States between 1935 and 1964. The law requiring this embossing was repealed in 1964 and thus no bottle found thereafter has the mark. This bottle was produced in Scotland and then purchased in the United States sometime before 1964. 9. Particular characteristics of the bottle itself indicate that it was machine made. If machine made, the bottle cannot be dated any earlier than 1905. The principal indicators for a “machine-made” determination are as follows: A) The vertical seams run from base to the top of the neck. These seams exist as a result of the parison and blow molds coming together in an Owens-style machine. B) A slight suction scar with some “shadowing” of the words is visible on the base of the bottle. Suction scars NEVER exist on mouth-blown bottles (pre-1905). C) Machine made bottles rarely have bubbles in the glass and are more uniform in the thickness of the glass. This bottle has no bubbles in the glass and the bottle is uniformly made. D) Finally, the bottle is marked on its base with “S692 Bottle Made in Scotland UGB” and these words are encircled by “Geo Ballantine & Son Ltd Glasgow Scotland”. If a glassmaker’s specialized symbol or mark wasn’t specifically embossed somewhere on the bottle and all that was present was a number, then it is a mold number and it will be relatively impossible to track down which bottle company made it. 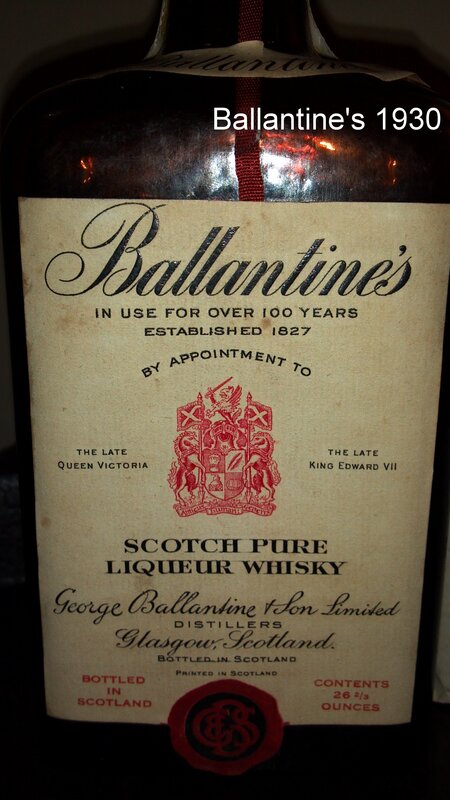 However, this bottle has a lot of information, all indicating that Ballantine’s produced (or purchased through a proprietary bottler) the bottle in Scotland and it was most likely machine-made after 1920. 10. The bottle cap is very important because it offers several clues. This edition does not use a screw cap. This edition has a cork which needs to be removed using a cork screw (and an extra cork cap to be used once the wine-style cork is removed). 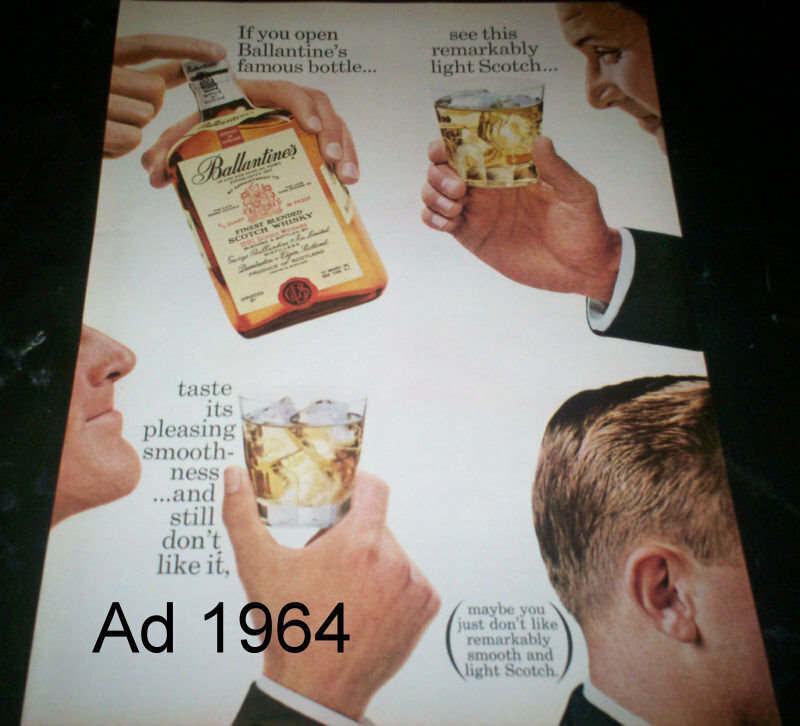 Even though Ballantine’s employed a screw cap for most of its blends, it would appear that Ballantine’s premium blends retained corked capping until at least 1964 when Ballantine’s did eventually switch to a screw cap for the 30-Year line in 1965 (and I’m not sure how they managed to do this and still retain the higher class nature of the 30 Year Old edition against the criticism of many scotch connoisseurs). The reason for the change appears to be that it was becoming more widely accepted that screw caps retained the quality of a beverage for much longer than the typical cork and also helped to prevent unwanted evaporation. The edition presented here does have some evaporation. As was hinted to parenthetically, the fact that the 30-year was corked suggested a particular clientele. The Kork-N-Seal cap was the most popular of the time (common to Buchanan’s, White Horse, and many other mainline scotches). This is significant for the following reasons: 1) The Kork-N-Seal cap was in use from as early as 1911 and continuing until the mid-1960s. It was a very reliable capping mechanism, and it was also extremely cheap. The higher classed whisky companies only used them for their lower-end editions, for which some also utilized twist-capping (which still exists as a preferred bottling cap today). 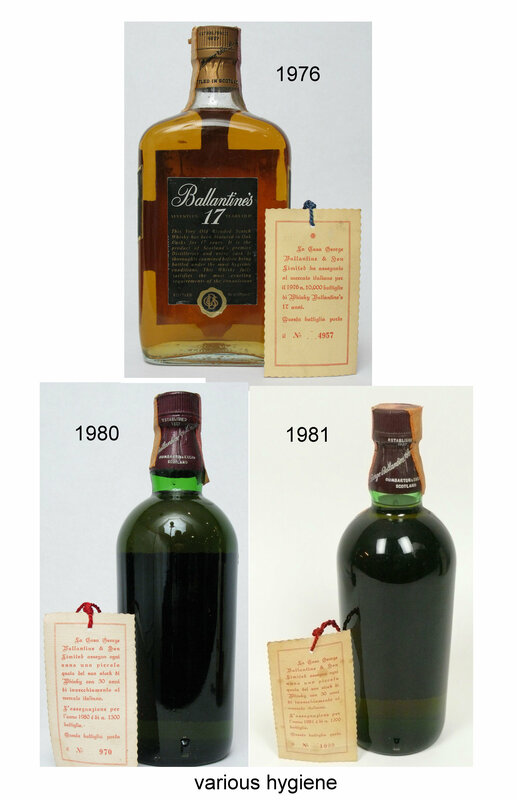 Of the two capping processes, Ballantine’s chose to use the twist cap for its “Ballantine’s Finest” and the later 12-year edition, but it chose the expense of using corks for their 17, 21, and 30-year editions. 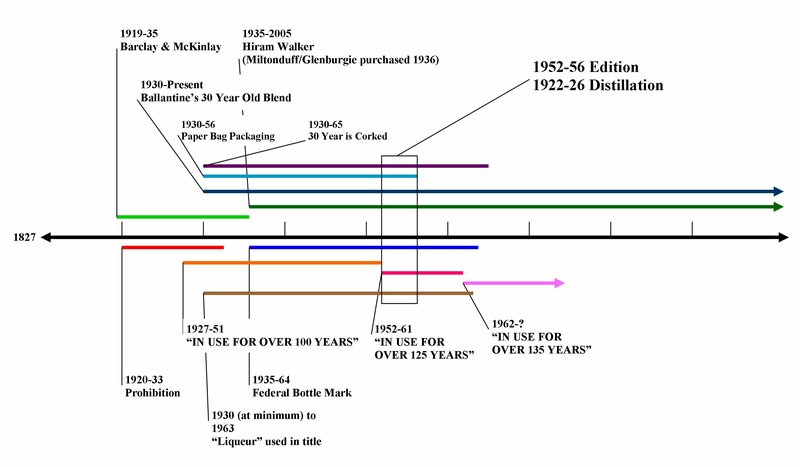 Thusly, in this assumed pre-60s time frame in which we find ourselves, it was expected that the 30-Year Ballantine’s would have been higher up the shelf. Being the top of Ballantine’s line, it was a finer blend and, relatively speaking, would have cost a pretty penny—just as it does today at its current $395. 12. In conclusion, please see the summary timeline image for the valuation. Based on the above evidence, this particular bottle was most likely bottled between 1952 and 1956, which means that the whisky inside was distilled between 1922 and 1926.
i have a bottle of ballantines thats “26 year old”. it has a tax stamp. Im trying to date the bottle. would you be able to help me do this? Send me an email with some high quality photos of the bottle. I have a bottle of Ballantine’s thats “30 year old” Liqueur Blended. It has tax stamp over the top of bottle. Im really curious to date the bottle. Would you help me? Send me photos and I’ll try. Where would photos be emailed to? 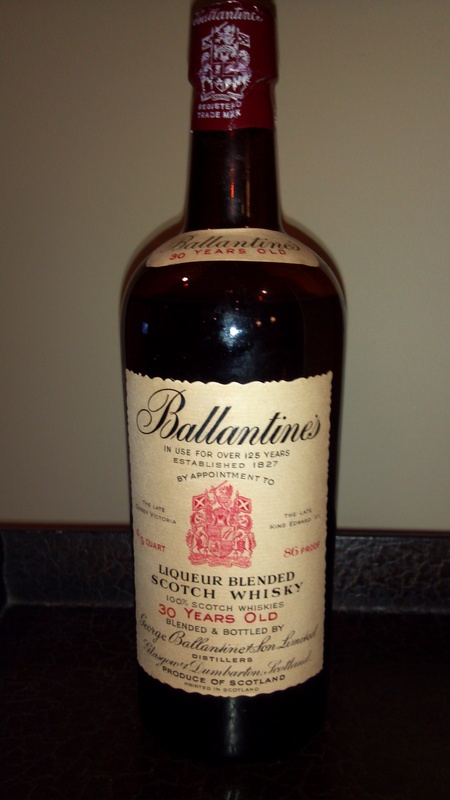 I have a Ballantine’s Aged 30 Years bottle that I’d like more info about. Thank you & Happy Thanksgiving to you and your family. You may send an email to angelsportion at charter dot net. Blessed Thanksgiving to you, too. I have a bottle that is 25 year old and it has the label “in use for over 100 years”. It was imported by “21” brands and has the embossed glass that says “federal law forbids the sale or re-use of this bottle” there has been some evaporation….any idea what it might be worth? Send an email to me at angelsportion at charter dot net and I will respond. I’d prefer to keep valuation requests private. And I seem to be getting a lot of them these days. I have several bottles of the same, and I’d love to compare your bottle with mine: If you have pictures, could you contact me at wchurst@hotmail.com. Looks like you’ve become quite the expert on the 30 year old Ballantine’s. I am trying to help my father date a bottle that was given to him and was wondering if you would be able to help us? Based on a few of your infographics it is if from the 60s most likely, but I would love another opinion. Go ahead and send me a few photos. Send them to angelsportion at charter dot net. We found your blog when we were trying to date and place a value on a bottle of Ballentines that belonged to my wife’s parents. The bottle is a 4/5 quart rectangular glass body and a rectangular glass top. It is still sealed with a red tape with “21” Brands Inc lettering and US Internal Revenue Tax Paid number. We were wondering if you would be able to help us. I am delighted of your expertises about 30 Years old Ballantines Whisky. May I ask you to help me, I want to figure out the real Year of production (if possible) of my 30 Years old Whisky. The bottle looks like one of your photos above, but is somehow different. The Label on the backside of the bottle gives evidence for original bottle import. I got it in 1986, but the box has a controll No: A45066/4/82. I assume it might be from April 1982, so the production Year could be 1952. I would really appreciate if you can help me. If it is ok for you, I propose to send you some pictures. Please let me know. As with the other posts in this thread, feel free to send photos to angelsportion at charter dot net. Glad you stopped by. Maybe I can help. Send an email to the address already listed in this thread and I’ll respond. Hello 🙂 I am so happy to have found your blog! A few years ago I was given almost an identical bottle to what you have on hand. The only difference being is that it has the tax stamp across sealing the bottle and underneath the bottle it says S987. The bottle is in perfect condition – would you be able to give me a rough estimate about the value of the bottle? Thank you! Since I’ve written and posted these various valuative efforts, I am regularly contacted by folks from all over the world asking if I will value whiskies for them. While I am not considered an expert, it would appear that I have been correct enough that folks have made some pretty good money from the editions I have “certified” so to speak. The problem is, while I enjoy the challenge/mystery/investigation, it’s not what I do for a living, and I don’t have much time to do it. And unfortunately, gratitude runs low amongst those who have received my help in the past. In other words, most folks get my notes and rarely even respond with a “thank you” for the effort. I’d be happy to help this one last time free of charge, but after this, I think I’ll ponder using a PayPal link for future valuations. M.M., I’ll contact you off line. I have your email. Thank you so much!! Any assessment you could provide would be muh appreciated. You are welcome. FYI, I did contact you right after the previous post. I read your final post and appreciate that you recognize people have used you for information without a follow up or a thank you or compensation for that matter. Sorry to hear that, it comes as no surprise to me as this world is filled with self centered greedy people. My question to you is, would you be willing to help me if I keep you in the loop and add 10% when I sell as long as a simple sincere thank you. I have a sealed bottle of Ballantines scotch that was acquired in 1938. It has never been out of the box, perfectly corked and taped and the box is in brand new condition. This is still wrapped in the original plastic, protecting the box and bottle inside. It was a gift to the Mayor of Paul Idaho in 1938. He is LDS, doesn’t drink and recently gifted it to me. I work for Schwan’s Home Food Serviceabd he is my customer. On Friday, he asked me if I wanted it. I am only looking for possible selling sites or collectors and value. Pictures to come if you agree to help. I’ll touch base with you very soon, Ryan. Hi I have a bottle of Ballantines LIQUEUR BLENDED SCOTCH WHISKEY. 30 years old. But it is in a glass decanter. Corked and sealed with a INTERNAL REVENUE # 99452510 Would really like some more info on it. Folks, please contact me through the “Contact” page. And by the way, I’m still here, Walter. I visit with my blog every day. And I’d be happy to share your information, but as a resource I trust. We’ve never worked together and I don’t allow “advertisements” for services on any of my pages. Your last post was sort of…well…an advertisement. Wonderful – I’m so pleased to see that you are still active on this site…I’ve received updates ever since my original offer to you here (to compare and share bottle info in Oct 2014), but hadn’t notice a “posted” reply on this page here in nearly a year: My earlier post today was only meant to assist others, in your apparent absence! You have done a wonderful job so far, in the amount of information that you have uncovered about the Ballantine’s brand history…and I look forward to reading about any further discoveries you make in the future. I certainly hope that my earlier post was not seen as some sort of “advertisement”. Please feel free to edit out anything you feel may be questionable, or remove it altogether, as obviously you are still here…so my offer to assist your reader in your absence is now a mute point. please do not hesitate to contact me…I’m more than willing to assist in any way ! PS – I do have one point of curiosity to discuss with you regarding the dating of the Kork-n-Seal caps, if you’d care to email me about that, I would be happy to discuss this particular subject with you. Walter, would enjoy the conversation, I’m sure. Send me note through the contact page and I’ll do my best to connect. I have a bottle I’m trying to identify the age of could anyone help? Calan, Visit the contact page and send me an email with the details. Cheers. Fernando, visit the contact page and send me an email with details and photos. Thanks.